Even if cities like Encinitas were to individually allow for denser housing, it wouldn’t make much of a dent in overall coastal housing affordability. Instead, the whole coastal region would need to take a leap together. Coastal California is notorious for its high housing costs. And to residents of beach communities like Encinitas, it’s not all that confounding. People like to live by the coast, after all. But that doesn’t explain it all. Among those so-called NIMBY (shorthand for “not in my backyard”) land use policies are zoning decisions that restrict how many homes can be built on a given piece of property. In a March study he co-wrote on statewide housing costs for the California Legislative Analyst’s Office, Brian Uhler found home prices in the state are 150 percent more than the national average – $440,000 versus $180,000. Uhler found policies that restrict building new housing are a big reason why. Fischel, likewise, points to 1970s-era, anti-growth policies intended to make it harder to build new homes as a culprit in the state’s high housing costs. In the 1970s, housing on California’s coast was 50 percent above the rest of the U.S.; it’s now three times the cost. Between 1980 and 2010, housing stock in California’s coastal zones increased by 32 percent, in other U.S. metro areas, it grew by 54 percent, according to the LAO report. Between 1940 and 1970, the number of homes in California coastal cities grew by 200 percent. Since the coast is such a desirable place to live, excluding people from living there forces them to move inland, driving up prices there, according to the report. It advises the state build more than 100,000 houses or apartments annually, almost exclusively in coastal areas. Encinitas, for instance, has been struggling for years to comply with a state law that requires cities to allow construction of low-income housing in certain areas. Yet since the city was incorporated in 1986, it hasn’t changed the zoning to allow additional housing on any property, according to the city’s planning department. Everything has either remained the same or been down-zoned. Zoning for lower densities, or down-zoning, a property will make the raw land cost cheaper – hence, how agriculture land, which you can’t build a lot on, got the reputation for being cheap – but it will make the homes built on the land more expensive. 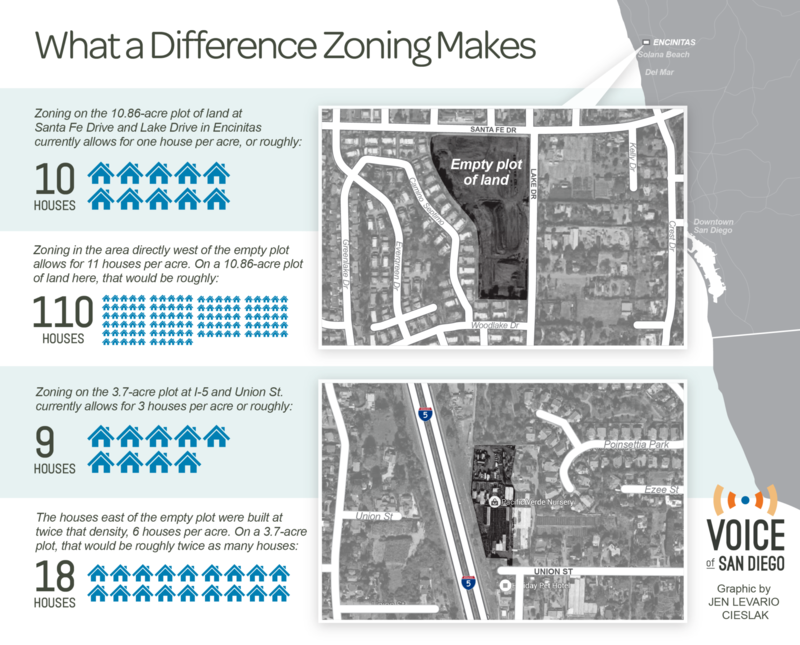 Two specific Encinitas examples demonstrate how zoning can increase housing prices. This 3.7-acre, undeveloped plot along I-5 in Encinitas was recently on the market for $3.1 million, according to a flier from Lee & Associates. Owners of this property and the one directly east of it can only build three single-family homes per acre, and each one needs to be built on at least a 14,500-square foot lot. If you divide the price of the land by the lots available, each lot of raw land would cost about $344,444. In reality, not all of this property can actually be used to build houses. Developers need to allocate some of it for infrastructure additions, so the raw land cost per lot would actually be slightly higher. The average three-bedroom home for sale on Zillow in Encinitas as of early November was about $1.2 million. A three-bedroom home built on these lots could go for easily $1 million, said Dave Gatske of Community Housing Works, a nonprofit that owns and develops low-income housing. Jeff Ziebarth of Ziebarth Associates and Erik Bruvold of the National University System Institute for Policy Research agreed. None of the experts have any financial connection to the property. So how does $344,444 land end up as a $1 million-plus home? You have to factor in construction costs and then the rest of the price is from bid-ups from eager home-buyers competing for the house. The cost of land makes up about 65 percent of the cost of a home on average in San Diego, according to decades of data provided by the Lincoln Institute of Land Policy, a land economics think tank in Massachusetts. Construction costs average roughly $216,053, according to the data set. Excluding price bid-ups, the price of a home built on that property would come to around $560,497. In this case, the price bid-up would account for around $500,000. If housing supply were to increase and get closer to demand, this bid-up amount would decrease. On the properties directly east of this property, although the area has the same current zoning, the homes are actually built more densely – there are roughly six homes on one 1.4-acre plot. These homes were built in the 1970s, before the zoning was changed to its current density. These homes are currently estimated to be worth $462,530 and $563,096, according to Zillow. Obviously, there’s a big difference between these homes that are over 30 years old, and potential new homes built in the area. But both are a long way from reaching $1 million. “The difference is big enough that those don’t account for the full price disparity,” said Uhler. This roughly 10-acre empty plot of land is zoned for one housing unit per acre. The homes directly west of it are on land zoned for 11 houses per acre, and the area was downzoned from 14.5 housing units per acre after the city was incorporated, according to Encinitas acting planning director Manjeet Ranu. The denser homes are more affordable than what could be built on the raw land next to it. One of the homes was just sold earlier this month for $496,000. Another is estimated to be about $493,967, according to Zillow. But if Encinitas were to independently up-zone properties to allow for denser housing, it probably wouldn’t impact prices that much. “If this particular community were to up-zone and let people build, if they were the only coastal community to do that, it probably wouldn’t make a big difference,” Fischel said. Instead, the city would need to act along with other cities in the region. That’s because housing supply and demand are regional, said Fischel and Uhler. If Encinitas allows for more housing, but other Southern California coastal communities with restrictive zoning policies don’t, prices won’t drop significantly. If they all act in unison, as Uhler urged in his report, housing along the coast would begin to get more affordable.